Give your field a Major League look without the cost. Heavy duty steel 3-1/2" O.D. main post with 18"W x 6'H wing panel. Bolt-on wing panel is all steel expanded metal. Tough powder coated finish over zinc undercoating. Designed for permanent or semi-permanent installation. 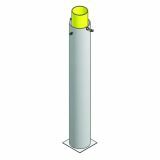 Optional ground sleeves for semi-permanent installation available separately. When installed, pole is 12 ft. above ground. Two piece telescoping pole. 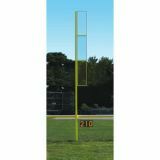 Base pole is 4-1/2" O.D. heavy walled steel tubing with 4.0" O.D. upper pole 18"W x 18'H bolt-on wing panel is all steel expanded metal. Tough powder coated finish over zinc undercoating. Designed for permanent or semi-permanent installation. Optional ground sleeves for semi-permanent installation available separately. When installed, pole is 30 ft. above ground. For semi-permanent installation of foul poles. Facilitates installation and maintenance. 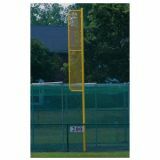 For 12' Foul Poles. For semi-permanent installation of foul poles. Facilitates installation and maintenance. For 30' Collegiate Foul Poles. 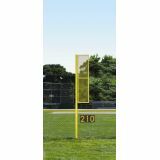 Outfield distance markers are printed digitally with 13 oz. reinforced vinyl fabric. Available with numbers and background colors of your choice (specify colors when ordering). Banner colors: forest green, red, yellow, royal blue, gray, tan and black. Font colors: white, yellow, black and blue. 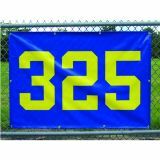 27"x 36" banner available with 14" numbers. One piece welded steel construction designed for permanent or semi-permanent installation. Main upright is 3-1/2" O.D. SS 40 zinc coated steel tubing. 18"W x 12'H fully welded wing panel includes heavy duty 1-1/2" x 13 gauge expanded metal mesh, designed to optimize air passage. 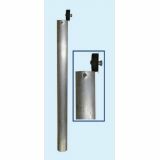 Optional ground sleeves for semi-permanent installation available separately. One piece welded steel construction designed for surface mount installation. Main upright is 3-1/2" O.D. SS 40 zinc coated steel tubing. 18"W x 12'H fully welded wing panel includes heavy duty 1-1/2" x 13 gauge expanded metal mesh, designed to optimize air passage. Two piece telescoping design for permanent or semi-permanent installation. Main upright is 5.0" O.D. Schedule 40 zinc coated steel tubing. Upper frame consists of a top upright made from 4.0" O.D. 8 gauge zinc coated tubing, with a fully welded wing panel constructed from 2.0" steel tube. 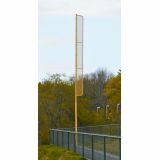 18"W x 18'H wing panel includes heavy duty 1-1/2" x 13 gauge expanded metal mesh, designed to optimize air passage. Optional ground sleeves for semi-permanent installation available separately. Two piece telescoping design for surface mount installation. Main upright is 5.0" O.D. Schedule 40 zinc coated steel tubing. Upper frame consists of a top upright made from 4.0" O.D. 8 gauge zinc coated tubing, with a fully welded wing panel constructed from 2.0" steel tube. 18"W x 18'H wing panel includes heavy duty 1-1/2" x 13 gauge expanded metal mesh, designed to optimize air passage.